Progress! 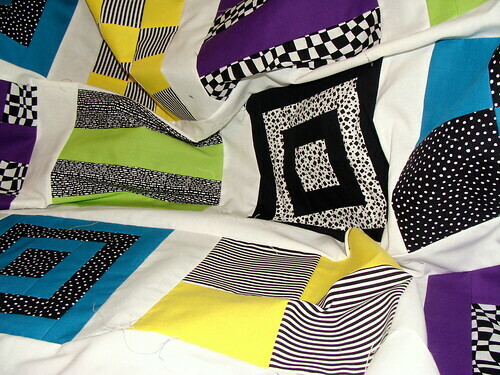 I’ve almost finished piecing the top of the Mod Sampler Quilt. It only needs the outermost row of sashing, and then it’s on to the back. I have no idea what I’m going to do about that yet, because I have the same block (in 5 different colours) left. They are very simple blocks, half solid-half print. Perhaps I’ll cut them up to make a stripe of 5cm colour/print and 5 cm white alternated, with white around and then solids. I was thinking green or blue and their corresponding prints. Suggestions?